In 1968, a small Japanese auto manufacturer based in Hiroshima debuted its first car in Canada, the R-100 coupe, and took the first step down a road that would eventually lead it to a prominent position among the most popular car manufacturers in Canada. The past five decades have seen Mazda go from triumph to triumph, giving Canadians the immensely popular MX-5 Miata roadster, the Mazda 3 sedan, and the Mazda CX-5 crossover SUV. Whether cleaning at up award shows or just serving satisfied customers day-in and day-out at its 165 independently owned dealerships across the country, Mazda has proved that simple design, intuitive engineering, and that zoom-zoom feeling are a perfectly suited to meeting the needs of drivers across Canada. · Special Edition Mazda 3 and Mazda CX-5 Vehicles: in recognition of Mazda’s two most popular Canadian vehicles, Mazda Canada has teamed up with Bose to create a special anniversary addition of the Mazda 3, Mazda 3 Sport, and Mazda CX-5, all of which are outfitted with a custom stereo system. · Win Your Mazda: across Canada, 50 Mazda shoppers have the opportunity to win the full price of their new Mazda vehicle in 2018. · 0% Financing and Anniversary Bonus: for a limited time, get 0% Financing and an up to $750 bonus on select on select new Mazda models at Yorkdale Dufferin Mazda. Even if you aren’t in the market for a brand new 2018 Mazda, there are plenty of other reasons to visit Yorkdale Dufferin. We have one of the best selections of pre owned Mazda cars in Toronto, and many of them certified. So, whether you are looking for a dependable three row crossover SUV like the CX-9 or asporty roadster you can enjoy the beautiful autumn weather in, you’ll find it at your Mazda dealership in Toronto. If you aren’t sure about whether or not you can secure a loan to buy a vehicle, don’t worry. For most Canadians, getting a good deal on a new vehicle means getting the best possible payment plan, and at Yorkdale Dufferin you will find a range of different financing options that can help put you in the driving seat of a new or pre-owned vehicle on a payment plan that works for your budget. If you’ve been planning on buying a new Mazda, then don’t put it off any longer: between our fantastic 50th anniversary deals and our great fall sales, you are sure to find the perfect vehicle at the best price. 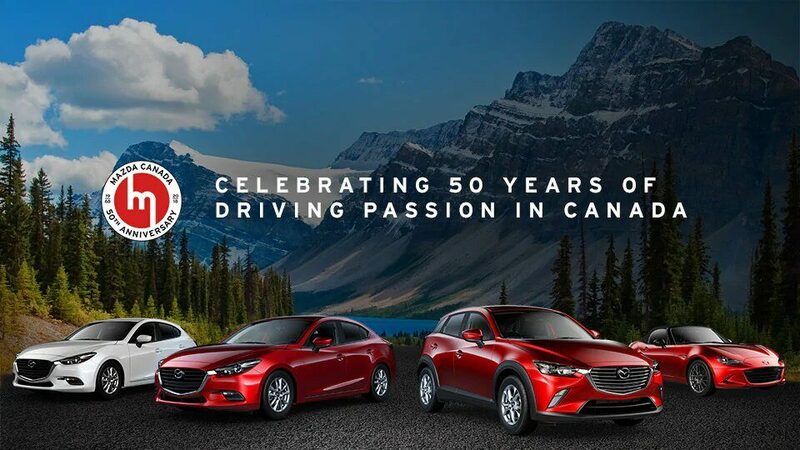 The most recent data shows that our vehicles are some of the most popular in Canada, and while we may be taking the opportunity this year to look back on Mazda’s fifty years in Canada, we remain focussed on serving the needs of our customers in the here and now. Yorkdale Dufferin Mazda this fall, and see what the future holds!